Unfortunately I have to suspend blogging on this site. I have an overwhelming – but very productive – workload to concentrate on. Part of it has to do with the campaign to add a balanced budget amendment to the United States constitution. This is now taking so much of my time that I have to put my research on Europe on the back burner for a while. I am working to set up a new blog for the purpose of economic analysis of the case for a balanced-budget amendment: americasfiscalfuture.com. If you haven’t already, do buy my book about the European economic crisis: Industrial Poverty – Yesterday Sweden, Today Europe, Tomorrow America. Thank you to all of you, my readers! You come from all corners of the world. I appreciate your loyalty, curiosity and interest. Best of luck to you. I hope I have inspired you to fight for economic freedom – wherever you are. More than a quarter century has passed since the Berlin Wall fell. The average American college student was born years after the subsequent reunification of Germany. How many Americans under 30 have a living memory of the “Soviet Union”? The Soviet empire was a force of evil – its leaders suppressed the most basic rights of its people, namely the rights to life, liberty and property. The only silver lining in the existence of the Communist empire was that it served as a constant, daily update on the reasons why socialism is an all-out economic and moral failure. It was, in other words, relatively easy to stave off onslaughts of socialism in the free world. A finger pointed at the monumental economic failure and the human disaster on the other side of the Iron Curtain could silence most critics of free-market Capitalism. When the Soviet empire was dissolved many people believed that an era of perennial freedom, peace and prosperity had emerged. Francis Fukuyama was one of the most fervent advocates of the theory of some sort of post-ideological world under the harmony of individual freedom. That, sadly, turned out to be a historic miscalculation. Socialism did not die in the rubble of the Berlin Wall. It staggered and struggled for a while, bruised by the undeniable defeat in the Cold War, but it slowly found its footing again. Perhaps the most notorious post-Soviet socialist leader was now-defunct Hugo Chavez, whose years as president of Venezuela marked a shocking decline of that country. Having been a well-working, prosperous nation with free markets and relative economic harmony, Venezuela was thrown into a long period of decline, erosion of prosperity, shattered property rights, rampant inflation, corruption, crime and general economic chaos. All in the name of the new, post-Soviet socialist battle cry: social justice. Chavez inspired left-leaning political movements in both North America and Europe. Among his most passionate European followers we find rising-star German socialist politician Sahra Wagenknecht, who is on a straight path to be chancellor in the not-so-distant future, and Greek prime minister Alexis Tsipras. Using the political achievements of Hugo Chavez as their springboard, Europe’s Chavistas have been able to whitewash socialism and remarket it as being all about “social justice”. It is now, together with borderline fascist nationalism, the fastest growing political movement in Europe. Its goal is to transform all of the European Union into one gigantic machine of state control, unrelenting redistribution, entitlements, and an assortment of hate-the-rich measures such as punitive taxation (even worse than today) and property confiscation. There is a lot to be worried about with this new social-justice driven version of socialism. For one, it makes ignorance a virtue: young college-educated men and women join it without questioning the economic, political, moral and historic credentials of the movement. In a Europe where one in five young men and women are unemployed, and most of the rest live off tax-paid entitlements, the cheap rhetoric of social justice sounds like an opportunity for revenge and resurrection of one’s self esteem. Another worrisome element is that the notion of social justice is spreading to North America. It is not just president Obama who talks about the need for more economic redistribution – the socialist gospel is preached by a plethora of organizations, blogs and media outlets. Unlike Europe, however, the United States is relatively immune to this ethical virus, especially after six years under the Obama presidency. This could just as well have been written by a secular advocate of socialism. In a blind test of who said these words, the leader of the rapidly surging, social-justice promoting new movement in Spain – modeled after Tsipras’ Syriza in Greece – would have been a more logical guess than Pope Francis. The very concept of “inequality” is antithetical to the foundations of a free society. It presumes that all men as not created equal, but created identical. Equality in creation, so to speak, means that we are all individuals with the same right to create, pursue and capitalize on the opportunities that lie before us, or we create for ourselves. We all have the right to live, to be free and to the proceeds of our work – property. However, the concept of “inequality” that Pope Francis uses has a different meaning. In his view, men are equal only if they achieve the same end results in life. If one man ends up living in a beautiful house in Santa Barbara, enjoying every day the gorgeous views of the Pacific Ocean, and another man lives in a shack in a favela in Sao Paulo, then the Papal principle of “equality” dictates that the man in Santa Barbara has unfairly gained something at the expense of the man in Sao Paulo. The Pope and other merchants of the same rhetoric propose that “social justice” is the cure for these differences between individuals. But even disregarding the well-documented economic consequences of redistribution of income, consumption and property, the theory behind “inequality” and social justice exercises considerable violence on reality. Any two human beings compared to one another will always exhibit differences. These are differences in ability, interest, physical and mental strength, endurance, curiosity… A man’s personality has so many dimensions it is almost impossible to find two individuals who come close to being identical. For this reason, every human being will perform differently under given circumstances. There are general trends in human behavior, trends which allow social scientists to explain and with reasonable accuracy make some predictions about how a random person will respond to given conditions. But no two persons will perform identically. For this reason, we the individuals will always achieve differently. Some will become wealthier than others. Some will reach farther than others in pursuit of wealth, career accomplishment or political influence. Therefore, in order to eliminate “inequality” as defined by the social-justice demagogues, one has to begin by eradicating differences between human individuals. Herein lies a major problem for anyone who proposes social justice from a theological foundation. Our individual differences are the result of God’s creation. We are all created in God’s image, but we are clones of God. We are imperfect by design – and we are also individually unique by design. If God meant for us all to accomplish equally, He would have made sure to eradicate any individual differences between us. When Pope Francis urges the elimination of “inequality” he adopts a secular view of society. That view, riding on the growing global popularity of social justice, may allow the Catholic church to harvest some short-term gains in a worldwide popularity contest, but it will not benefit the future of either the church or our society. Social justice requires an authoritarian government, at least of the caliber known as the “welfare state”, and therefore is directly antithetical to the individual’s right to life, liberty and property. Put bluntly: by joining the social-justice choir, Pope Francis is giving his nod to continued eradication of the principles and institutions that built our free, prosperous Western Civilization. More frighteningly, the farther one walks out on the limb of social justice, the more authoritarian society has to become. As social justice takes precedence over individual freedom, the expansion of social justice comes at the expense of individual freedom. With President Reagan’s warning ringing in the background, one is inclined to ask the Pope if he knows any boundary, any limitation, of the pursuit of social justice. Or, in more modern terms: when is government big enough? The welfare state is alive and kicking, not just in Europe but in the United States as well. We are at different stages of welfare state evolution (or decline), with Europe being one or two major reforms ahead of us, but the path is inevitably the same. In fact, during the Great Recession, when the European welfare state was subjected to downsize-to-save-it austerity policies, the American welfare state kept growing. Both the federal government and the states kept hiking spending in typical welfare-state areas such as welfare, health care and education. Irresponsibly ignoring its deficit, U.S. Congress allowed the welfare state to expand, impervious to the general macroeconomic conditions of the nation’s economy. Ironically, even though the United States is a more decentralized structure than the European Union – and many European member states – the American welfare state is actually more centralized. The federal government spends more than half-a-trillion dollars every year on entitlement programs that are formally run by the states. Medicaid is a well-known example. This means that the states de facto become agents of the federal welfare state, and it really does not matter what state you live in – you get the welfare state no matter what. My own home state, Wyoming, is a case in point: even though Wyomingites pride themselves of being rugged individualists, our welfare state is among the more generous in the country. Of total state government spending, 66 percent is for entitlements and income redistribution. Has libertarianism been marginalized to the outer rim of the American political universe? The answer, scary as it is, appears to be affirmative. Even if the term “libertarian” is still used frivolously, its content seems to be adrift at best, void of meaning at worst. In a recent podcast Cato Institute research fellow Emily Ekins suggested that some 20 percent of all Americans harbor libertarian values. Her definition of “libertarian values” is that a person is fiscally conservative and socially liberal. The fiscal conservatism, in turn, is defined as preferring a lower corporate tax to a higher corporate tax, and less government spending to more government spending. In a Policy Analysis for Cato, Ekins and FreedomWorks vice president David Kirby shed a bit more light on what “economic conservativsm” means in this context. Analyzing the libertarian roots of the Tea Party movement, Ekins and Kirby move a bit deeper into the issues. However, their attempt at identifying where Tea Party libertarians stand on individual issues remains within relatively traditional frames: more or less government spending; higher or lower taxes; for or against TARP; for or against Ron Paul as presidential candidate. In a nutshell, according to Ekins and Kirby the actual policy content of the term “libertarianism” has been reduced to one end point on a yardstick that runs from “more” government to “less” government. At no fault of theirs, Ekins and Kirby avoid entirely the principled questions that have defined libertarianism over at least the past four decades. 5. Together, the ban on taxation and the sacrosanctity of property preclude forceful redistribution, i.e., a welfare state. The only exception is taxation to provide for an impartial judiciary; if courts are private, as in the ultra-minimal state, Nozick credibly argues that excation of compensation will be biased. That point aside, the argument Nozick makes against the welfare state is as forceful as it is challenging. It also provides the core of the modern definition of libertarianism, namely a society in absolute economic freedom. Forced income redistribution is immoral, and therefore the welfare state is antithetical to libertarianism. When Ekins and Kirby present libertarianism as it is understood today, both in the Tea Party and in American politics in general, the gap between Nozick’s definition and the term’s common contemporary useage is quite frankly Gragantuan. At least 80 percent of the $4.5 trillion of federal, state and local government spending in today’s United States is of the redistributive kind, yet we never hear libertarians argue for the abolition of those spending programs. Even firebrand libertarian and former Congressman Ron Paul wants to preserve America’s most costly, most intrusive entitlement programs: Social Security and Medicare. Undoubtedly, the balance point of what classifies as “libertarianism” has moved away from Nozick’s origin, toward the center of the political spectrum and thereby within territory where you accept the welfare state as a phenomenon. But it is not just the political meaning of libertarianism that has changed – long before Nozick made his stellar contribution there were obstacles put in the way of ideas like his. For example, in Article 7 the Wyoming constitution prescribes entitlement spending in the form of government spending on education. What does this mean for libertarians? What does it mean for Wyoming – and for America? Is libertarianism, real libertarianism, dead and gone? Has the ideology of the welfare state conquered not just America and Wyoming, but even the term “libertariainsm” itself? The eurozone edged out of a four-month period of deflation in April, according to the EU’s statistical agency. An estimate by Eurostat released on Thursday (30 April) found that consumer prices were flat in April 2015, up from -0.1% in March. Prices had fallen for four consecutive months since December. According to this measurement, consumer prices are actually rising in the euro zone, by more than one percent in April. 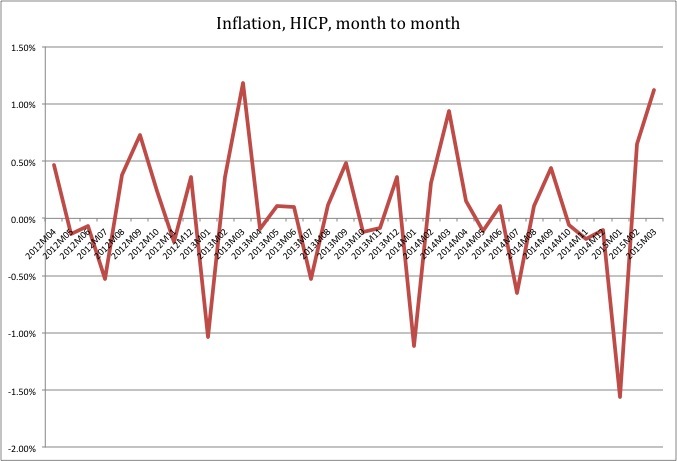 However, inflation is not measured as month-to-month changes in a price index. It is measured on an annual basis. The measurement can be either calendar year or annual comparisons month by month. In the latter case the usual procedure is to remove seasonal variations from the data in order to obtain a smoother curve reflecting long-term changes in prices. This method is dubious as it places a filter between the observer and the reality he is trying to understand. I avoid seasonally adjusted data in general as much as ever possible, and inflation data is no exception. 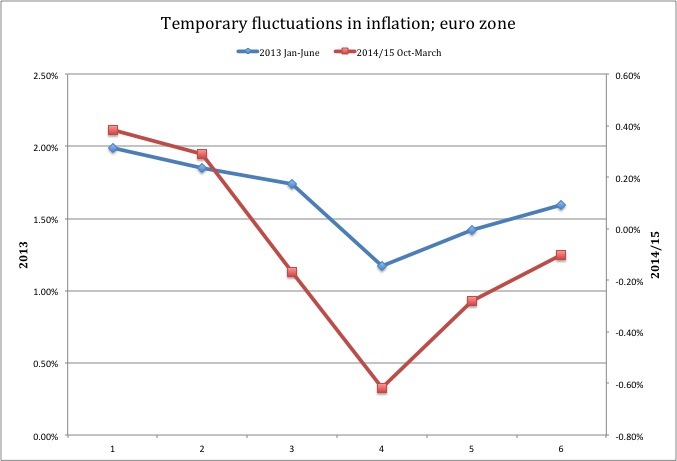 When reported on an annual basis, inflation in the euro zone suddenly looks quite different. The downward trend is unmistakably bound for deflation territory (and the trend line here is a third-degree polynomial function, so if there were any changes in the trend we would see them). Reasonably, prices do not plunge into deflation as fast as they do through the inflation part of the chart; once inflation hits zero the down bound trend will weaken drastically, even vanish altogether. However, not only is this a somewhat uncertain prediction – the knowledge among economists about deflation is very limited compared to their knowledge about inflation – but it is also important to keep in mind that even if prices stop plunging there is no reason to believe they will start rising again. But what about that little uptick at the end of the curve? What about the observed positive price change for April as reported by the EU Observer above? Here is where we have the true advantage of looking at “real” numbers, not seasonally adjusted ones. Because the data we analyze has not been smoothened out by seasonal adjustments, we have access to all the real-world kinks and crooks in the inflation curve. The 2013 excerpt ends with June and an inflation rate of 1.75 percent. For July that year inflation was 1.72 percent, in other words basically the same. After that, the rate started declining again. For 2014/15, April is the first month beyond the excerpt. 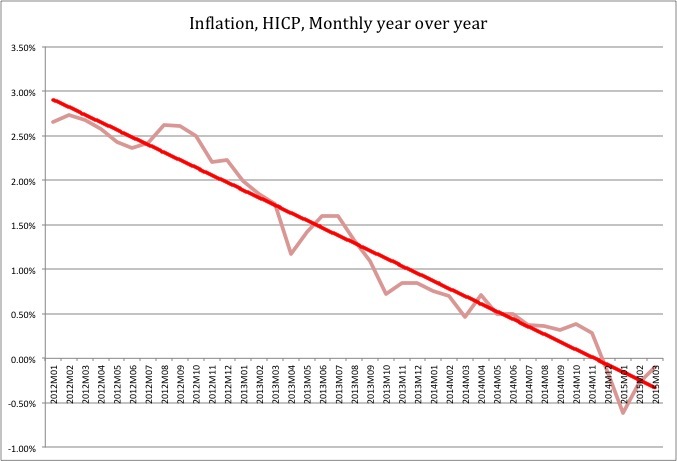 In accordance with the events of the first half of 2013, it is logical that inflation has not yet turned downward again. But it would be rather surprising if there was some sort of rebound in prices back into inflation territory at this point. There simply are no macroeconomic reasons for a rebound to happen. And at the end of the day, that is where you find the meat and potatoes of this issue. Traditional macroeconomic analysis centers in on GDP growth, consumer spending, private-sector job creation, business investments… If there is no upward movement in those variables, it is very difficult to find any reason why there would be inflation in the economy, especially over time. There is one exception: pure monetary inflation. The kind they have in Venezuela and Argentina. Surely nobody in the euro zone would want that? Thought so. Which brings us back to the point just made: there will be no sustained trend of inflation in Europe until the real sector picks up and starts growing again. Are you tired of high taxes? Then move to Liberland. A self-professed Libertarian politician from the Czech Republic says he has created a new, sovereign country on the Croatian-Serbia border where citizens decide their own tax burden, property and individual rights are respected and the national motto is “Live and Let Live.” Vít Jedlička, a member of the Conservative Party of Free Citizens, recently appointed himself president of the Free Republic of Liberland, a “micronation,” located on the banks of the Danube River in a 2.7-square-mile patch of what he says is unclaimed territory. Jedlička says neither neighboring nation claimed the land when they established their borders following the breakup of Yugoslavia, and claims international law allows his claim. While this sounds like a pie-in-the-sky idea concocted by some idealist libertarian, it is actually more serious than that. The land patch Mr. Jedlicka has claimed is four times bigger than Monaco, a well known freedom zone in otherwise heavily statist Europe, and almost exactly the same size as Gibraltar. In other words, at least in terms of territory “Liberland” is big enough to give its residents a fair chance. But regardless of whether Mr. Jedlicka ever manages to create Liberland, his idea is presents a theoretical and political challenge to statists and libertarians alike. Government involvement in our lives, our families and our businesses has reached such a level that it is almost unimaginable that unabridged freedom is almost unimaginable. Big government has become a way of life. The best way to shake up the conventional-wisdom image of big government as a given structure in our society is to do what Mr. Jedlicka is suggesting: to carve out a chunk of land and allow it to compete with big-government nations as a libertarian jurisdiction. Twenty-five counties in Kentucky, most of Detroit, and many of America’s large cities suffer from chronically high unemployment. Government stimulus packages haven’t worked because they insist on picking winners and losers. I propose a stimulus that simply leaves more money in the hands of those who’ve earned it. Economic Freedom zones – areas of reduced taxes – are different than a government stimulus. Economic Freedom Zones encourage businesses and individuals which the market has already selected. Only one out of ten small businesses succeed. Consumers vote every day on which businesses succeed. Reducing taxes in economically depressed areas is a stimulus that will work because the money is returned to businesses and individuals who have already proven that they can succeed. The theory behind the idea is that there is a defined set of obstacles that stand in the way of entrepreneurship, jobs creation and rising prosperity; if those obstacles are removed the zones will thrive and lift their residents out of poverty and despair. There is nothing wrong with this theory. In fact, there is a lot of support for it from experiences around the world over the past several decades. Commonly these areas are called Special Economic Zones, simmply because the term “economic freedom zone” hints that the economic success of those zones has something to do with economic freedom. In reality, most Special Economic Zones have been created as a tool for providing businesses with more favorable conditions than are otherwise offered in a country. The original recipe for a Special Economic Zone was the removal of trade barriers and generally lower taxes; over time some zones have added financial incentives – also known as corporate welfare – and preferential treatment based on, for example, the geographic origin of investing companies. These measures are contradictory to the principles of economic freedom. Suspend the capital gains tax. 1. The duration of the zone itself. The advantages offered by Senator Paul’s zones will benefit small businesses with high mobility and low fixed costs of operation. These are companies that can take immediate advantage of lower taxes, especially if they are labor-intensive. But if the zones do not last more than a few years, these companies will be ready to move to where post-zone economic conditions are better. If this happens, the revitalization may turn out to be temporary. Larger, more long-term oriented businesses require lasting beneficial economic conditions, in other words that the freedom zones gain permanent status. 2. Jurisdictional overlap. Senator Paul’s proposed zones would be entirely federal in nature. Since the federal government is an intrusive entity in the economy, it carries some promise of success that this would be a federal project. At the same time, there is a significant risk that states and local governments would try to get their share of the prosperity generated by the zones. A lower corporate income tax could, for example, be countered by a higher state income tax, just as a lower income tax in a city could be countered by an increase in the local income tax. In other words, to maximize the likelihood of success Senator Paul’s proposal must incorporate reciprocity agreements with other jurisdictions: no counter-measures by states, cities, counties and townships. 3. Venture capital supply. Senator Paul’s model creates better economic conditions and it is reasonable to expect a surge in entrepreneurship within the zones. At the same time, there can be no significant improvement in economic conditions without supply of venture capital. Since a major problem in impoverished areas is the lack of local venture capital, it is important that Senator Paul’s model is constructed in such a way that outside venture capitalists will consider supporting new and growing businesses in the zones. This last point is perhaps the most crucial one. The type of funding can make a big difference, as exemplified by the revitalization of this neighborhood in Cleveland. Senator Paul’s idea is not complete as it stands today – it needs to address the issues presented here – but it is definintely worth taking seriously. Greece keeps pushing the currency union envelope. Mr. Tsipras, the socialist prime minister, is driven by his ideological convictions and therefore plays a different game than the leaders in Brussels with whom he is negotiating to keep his country afloat. The problem for the European leadership is that it seems incapable of understanding what role Tsipras’s ideology plays for his actions – Tsipras wants full independence for Greece so he can build his version of the socialist dreamland that now-defunct Venezuelan president Hugo Chavez created. Rational arguments such as “property rights no longer exist in Venezuela” or “they have 60 percent inflation” and “crime is rampant and there is a shortage of almost every daily necessity” do not work on ideologues like Tsipras. That is the very problem with them. Therefore, you cannot reason with them as though they were swayed by the same type of “sensible” arguments that you are. But more importantly: so long as the EU leadership does not understand that politicians like Tsipras are ideologically opposed to everything that the EU stands for, they will not be able to have a rational conversation. There will be constant discords, where the EU leaders try to set goals that will help Greece stay inside the euro zone – and ultimately the EU – while Tsipras and others like him (think euro skeptics in Italy and Spain) will try to create circumstances that allow them to get what they want, namely out of the euro zone (and eventually the EU). The biggest danger with this discord is that once the euro zone starts breaking apart, the retreat from the common currency will be disorderly. There is no doubt that the Bundesbank in Germany has a contingency plan for that disorderly dissolution, but it is far from certain that their plan will work. There are so many uncertain factors in this game that an even reasonably confident prediction is out of the question. That said, there are some fixed points that can be put in the context of macroeconomic reasoning. That in turn should at least provide some insight into the best and worst case scenarios. The stand-off between Greece and its lenders deepened over the weekend ahead of a meeting of euro finance ministers on Friday (24 April), with both sides exchanging barbs over the risk of a Greek default and its consequences for the eurozone. On Friday, Eurogroup president Jeroen Dijsselbloem said both parties should avoid “a game of chicken to see who can stick it out longer. We have a joint interest to reach an agreement quickly”. An agreement about what? If Greece secedes from the euro it can, at least theoretically, run away from its bailout-related deals. In practice, the EU would still want to enforce loan contract, but it is much more difficult with a country that has a currency of its own – a currency that in all likelihood will be depreciating rapidly. As for the IMF, Greece would have to deal with them separately, but it could do so much more so on its own terms once outside of the euro zone. EU and International Monetary Fund (IMF) leaders warned that Greece had to make quick progress to finalise a list of reforms that would enable it to receive a €7.2 billion loan. But they hinted that a Greek default could be managed by the eurozone. “More work, I say much more work is needed now. And it’s urgent,” said European Central Bank (ECB) chief Mario Draghi in Washington, where he was attending the IMF’s Spring meeting. “We are better equipped than we were in 2012, 2011, and 2010,” he added, referring to the years when fears of a eurozone break-up were at a high. “Having said that, we are certainly entering into uncharted waters if the crisis were to precipitate, and it is very premature to make any speculation about it,” Draghi also said. This is a key statement. Some would interpret it as Greek leverage in negotiations with Brussels. However, the correct way to read it is as a blunt warning of what is to come: sooner or later Greece will leave the currency union, and it will do so like the men who escaped Alcatraz in 1962. Once someone has done what everyone thought was impossible, then just as Mr. Varaoufakis says, the only question on everyone’s mind will be: who’s next? British Member of the European Parliament for the UKIP, Mr. Nigel Farage, made a great point recently when appearing on BBC (at about 2:25 into the video): the initial effect of a Greek currency secession is going to be a boost in growth as the currency depreciates. This growth spurt will inspire other struggling euro-zone states to consider a return to their national currency. Once the secession movement gets off ground, it is uncertain how many states will actually reintroduce their national currency, but it would be reasonable to expect a first round of secession to sweep from Athens to Lisbon. The short-term financial turmoil aside, the most likely effect will be a southern European currency war. The four countries that have historically had weak currencies will find themselves returning to that position, only with an even deeper macroeconomic ditch to climb out of. The only moving part of their economies is, actually, exports, which will get a boost from a rapid currency depreciation. At the same time, that depreciation will be a major conduit for imported inflation, which in turn will eat its way into the economy a bit after the exports boom has gained momentum. The more the currency depreciates, the stronger the imported-inflation effect will be. Inflation will have major consequences for the government budget. Depending on what type of inflation indexation is built into the welfare state’s entitlement programs, the cost of government spending will rise more or less with inflation. While inflation can also be beneficial to the revenue side of the state budget, it negatively influences the purchasing power of households and generally (but not always) depresses business profitability. As a result, domestic economic activity slows down, causing the tax base to stagnate. And this is where the major test comes for currency secessionists: how will they handle their budget problems? With weak currencies they will have a hard time selling their treasury bonds on the international market; they can load up their banks – a likely scenario in Greece where a Syriza government could even go as far as to nationalize banks – but as the Great Recession demonstrated, leaning on banks for funding a government deficit is a particularly bad idea. When banks are overloaded with bad government debt in the midst of a macroeconomic crisis, then suddenly it is 2009 again. Very briefly, then: once the euro zone starts falling apart the first ones to leave will face very difficult challenges. That is not to say that the remaining euro zone countries will have a better life – it is very likely that the euro zone itself won’t survive the 2017 French presidential election – but once the Southern Rim has left the euro zone the remaining countries will have a somewhat easier time following an orderly retreat plan. In fact, it would not be surprising if Germany, Austria and the BeNeLux countries remained in a “core” currency union – a Gross-Deutsch Mark, if you will. That currency could actually become a stabilizing point for a post-euro EU. Still, even with an anchor currency in the heart of the EU, an implosion of the euro will have major negative effects for the European economy. What will those effects look like? That is a subject for another article. For more than a year the European economy has been in deflation territory. To reverse that trend the European Central Bank launched its Quantitative Easing program, aimed at flooding the euro zone with liquidity. According to crude monetary theory this will drive up prices in line with the so called quantity theory of money; few if any central bankers would admit that their take on money supply and inflation is this simple, but the only other explanation is so far-fetched that even the quantity theory of money makes sense. The alternative theory says that the reason why businesses are not investing in Europe is that there is not enough cheap risk capital available in the economy. For this theory to work, though, the cost of borrowing that businesses face would have to have been exceptionally high during the recession. In fact, the exact opposite is true: since the Great Recession started the composite cost of borrowing for non-financial corporations in the euro zone has been in the 2-4 percent bracket. Right before the recession it topped out above ten percent. In other words, the has been an abundance of liquidity available for anyone and everyone willing – and qualified – to borrow. But if your business outlook says flat sales, at best, you are not going to take on new loans. And flat sales or worse has been the forecast story for European businesses for six years now. What does this have to do with inflation? Well, low economic activity means low demand and low utilization of productive capacity. As a result, there is no upward pressure on prices and therefore no real-sector inflation in the economy. Whatever inflation may be looming in the near European future has a monetary origin. Does this mean that the primitive quantity theory of money is correct? No, it does not. The quantity theory rests on a rigid structure of assumptions regarding the operation of a free market, both in terms of the flexibility of real-sector resources and of free-market prices. The most confounding part of the quantity theory of money is that the economy axiomatically always reverts back to full employment; then, and only then, can monetary inflation occur. Europe is about to line up with several other countries proving that monetary inflation is just as possible – if not more possible – in a stagnant economy. In fact, when stagnation and low capacity utilization is combined with monetary inflation, there is a macroeconomic venom brewing. The worst response to this situation is one where key decision makers assume that the monetary inflation they see is actually real-sector inflation. Be thankful for small mercies. The world economy is no longer in a liquidity trap. The slide into deflation has, for now, run its course. The broad M3 money supply in the US has been soaring at an annual rate of 8.2pc over the past six months, harbinger of a reflationary boomlet by year’s end. Europe is catching up fast. A dynamic measure of eurozone M3 known as Divisia – tracked by the Bruegel Institute in Brussels – is back to growth levels last seen in 2007. But GDP growth, business investments, employment and capacity utilization are far from 2007 levels. While inflation back then was a real-sector phenomenon, it is not founded in real-sector activity today. History may judge that the European Central Bank launched quantitative easing when the cycle was already turning, but Italy’s debt trajectory needs all the help it can get. The full force of monetary expansion – not to be confused with liquidity, which can move in the opposite direction – will kick in just as the one-off effects of cheap oil are washed out of the price data. Inflation will soon be flirting with 2pc across the Atlantic world. Within a year, the global economic landscape will look entirely different, with an emphasis on the word “look”. In my view this will prove to be mini-cyclical in a world of “secular stagnation” and deficient demand, but mini-cycles can be powerful. Mr Stein said total loans in the US are now growing at a faster rate (six-month annualised) than during the five-year build-up to the Lehman crisis. Again, all macroeconomic indicators point to a continuation of a ho-hum recovery here in the United States, the March GDP numbers notwithstanding. At the same time, practically nothing says that Europe will enjoy anything near a U.S. growth period any time soon. Therefore, it is wrong to compare the inflation rates in Europe and the United States as if they are apples and apples. They are not. Our inflation here in the United States is the result of a steady rise in economic activity, a tightening of available capacity in infrastructure and other capital stock and even a glimpse of labor shortage in some sectors. In other words, traditional causes of inflation. Europe, on the other hand, still suffers from almost twice the unemployment rate, with GDP growth at half or less the rate of ours. To really drive home the point about Europe’s abundant, idling economic resources, let us once again repeat the point that the cost of borrowing for non-financial corporations is down to 2-4 percent (after topping 10 percent before the Great Recession). There is in other words no demand-driven push on prices to rise in Europe. This means monetary inflation, and there is an abundance of evidence from the past century on just how destructive and unstable such inflation can be. “The risk is that the Fed will have to raise rates much more quickly than the markets expect. This is what happened in 1994,” he said. That episode set off a bond rout. Yields on 10-year US Treasuries rose 260 basis points over 15 months, resetting the global price of money. It detonated Mexico’s Tequila crisis. Bonds are even more vulnerable to a reflation shock today. You need a very strong nerve to buy German 10-year Bunds at the current yield of 0.16pc, or French bonds at 0.43pc, at time when EMU money data no longer look remotely “Japanese”. Just one second here… No longer remotely “Japanese”? GDP growth for 2014 in the euro zone (19 countries) was 0.89 percent, and 1.3 percent in the EU as a whole. How is that not “Japanese” data?? [The U.S. labor market] is turning. The quit rate – a gauge of willingness to look for a better job – is nearing 2pc, the level when employers must build pay-moats to keep workers. It is true that the US economy gave a good imitation of hitting a brick wall in the first quarter. Retail sales have fallen for three months, the worst drop since 2009. The Atlanta Fed’s snap indicator – GDPNow – suggests that growth dropped to stall speed in March. The rise in non-farm payrolls slumped 126,000 in March, half expectations. Yet economies do not fall out of sky. The US has already survived the biggest fiscal squeeze since demobilisation after the Korean War without falling into recession. And again, some sectors and states are already in tight labor supply. Try hire a Hooters waitress for less than $15/hr in North Dakota. Some trucking companies are pushing annual driver compensation north of $70,000. But perhaps the problem, at the end of the day, is that analysts and commentators focus on too many variables at the same time. You can certainly look at the economy from an almost infinite number of angles and get different stories out of each one of them, but in reality some angles only show symptoms while others capture the causes. Mr. Evans-Pritchard stretches his analysis a bit thin, going into asset prices and a roster of secondary data, elevating those numbers to the same prominence as – actually higher prominence than – real-sector growth data. In reality, asset prices depend on real-sector growth data; tainted by speculative expectations, they only give an imperfect image of where the economy is really heading. When we look at the European and American economies from the angle of real-sector activity, we do again see the gaping difference between a growth, moderately healthy United States and a stagnant, industrially poor Europe. The former has a sound form of inflation on its way; the latter is experiencing the beginning of a dangerous episode of monetary inflation. That said, I still recommend you all to keep reading Ambrose Evans-Pritchard. He is intelligent and thorough and he has no problem presenting unpopular views if he believes they are merited. Greece just made its IMF payment due last week, indicating that the socialist government still does not think it has strong enough support among the Greek general public to secede from the euro zone. It is unlikely that any other arguments will keep them from reintroducing the drachma; high inflation – an inevitable consequence of a drachma resurrection – does not discourage socialists in other countries, such as Venezuela, from pursuing reckless domestic policies. Syriza, whose leader Tsipras is a dyed-in-the-wool Chavista socialist, wants to be the first to bring the warped ideology of Hugo Chavez to Europe, and he is not going to let his plans be spoiled by petty things like currency turbulence or 50-percent inflation like they have in Venezuela. However, if the population generally is against a currency secession, he runs the risk of a parliamentary challenge long before the next election. His majority is very slim, and depends critically on the participation of a small nationalist party that could be peeled away by a determined opposition. In other words, Tsipras is walking a thin line to get Greece to where he wants her to be. Greek Finance Minister Yanis Varoufakis said on Thursday (9 April) that the government was restarting its privatisation programme and was committed to avoiding going into a primary deficit again. Prime Minister Alexis Tsipras’ government has been opposed to some asset sales but has promised not to cancel completed privatisations, and only review some tenders as part of the terms of a four-month extension of its February bailout program me. “We are restarting the privatisation process as a programme making rational use of existing public assets,” said Varoufakis, speaking in Paris. This is how they are going to balance the budget: by means of one-time sales of assets. It is like selling the living room couch to pay your mortgage. What are you going to sell next month? The previous Greek government did the same thing, obviously to no avail. In fairness, though, the Greek government has very few options. Despite some weak signs of a fledgling recovery earlier this winter, there is no clear rebound in the Greek economy. Private consumption, measured as four-quarter moving averages and adjusted for inflation, has stabilized a bit under €30bn per quarter. This is a substantial loss from the €37bn per quarter recorded right before the Great Recession, and it means that the Greeks have basically been sent back to 2001 in terms of standard of living. 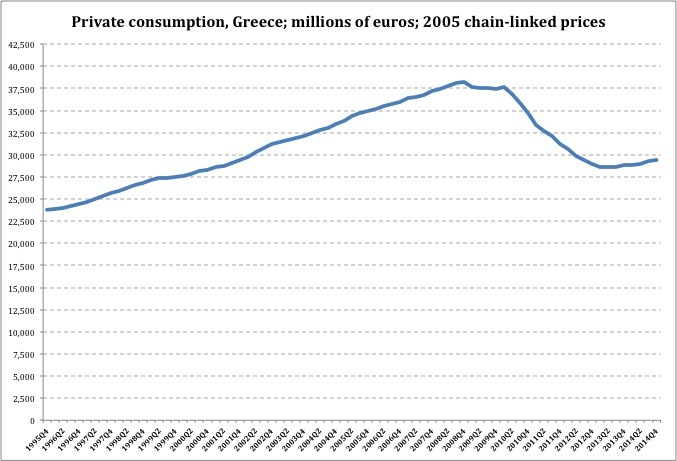 Since private consumption is the driving force of the economy, its decline and stagnation since 2008 is the most vivid expression of the deep suffering that the Greek people has had to live through. That said, they have also asked for more by electing a socialist for prime minister whose comprehension of economics is weak, to say the least. Tsipras, like all socialists, sees government as the indispensable economic agent; everything else is either debatable or out of the question. With consumption again measured by quarter, with four-quarter moving average adjusted for inflation, and then divided by employee, it looks like the Greeks are able to work their way up a little bit in terms of purchasing power. In the first quarter of 2011 per-employee consumption was €8,004; for the last quarter on record, Q3 of 2014 it was €8,178. This does not look like much of an increase, but the underlying trend is weakly positive. 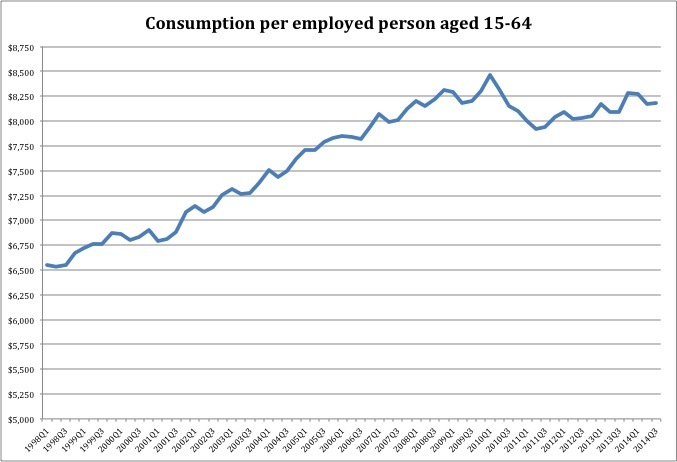 This means that while only 54 percent of the Greek population 20-64 actually have a job, those who do are slowly beginning to establish a “new normal” of consumption. It is a normal that is characterized by stagnation, with almost no outlook toward reasonable gains in the standard of living – it is in essence life under industrial poverty – but at the very least this little rebound is an indicator that things are not going to get worse. Ceteris Paribus, of course… And as one of my favorite economics professors from back in college loved to point out: ceteris is not always paribus. Things change. And not always for the better. Especially when you have a prime minister dedicated to the mission of bringing Chavista socialism to Europe. Come Scylla or Charybdis. For the people who live in the European Union, daily life offers challenges in the form of zero growth, high unemployment, lack of opportunity and a gloomy outlook on the future. For a macroeconomist, however, the EU is a formidable experiment that must not be left undocumented. The union was constructed based on the European tradition of welfare statism, right when the welfare state as a socio-economic construct was beginning to show clear signs of macroeconomic ailment. For unknown reasons – though probably ideological preferences played a good part – the architects of the EU misinterpreted the symptoms of macroeconomic ailment such as persistent budget deficits. They saw them as expressions of irresponsible budget policies and therefore institutionalized budget-balancing guidelines for member-state fiscal policies. Those guidelines became the EU’s own constitutional balanced-budget requirement, also known as the Stability and Growth Pact. The Stability and Growth Pact was created essentially to secure the fiscal sustainability of the European welfare state. The problem is that the welfare state in itself is not fiscally sustainable. A wealth of literature (which I am currently working my way through as part of my next book project) and a plethora of compelling data together convincingly show that the welfare state is in fact the fiscal venom that causes governments to go into structural deficits. So far, though, the political leaders of the European Union have not understood that their practice of the Stability and Growth Pact – known as statist austerity – has driven the European economy into a permanent recession. Their governments, consuming up to half of GDP, are subjected to spending cuts and in turn subject the private sector to higher taxes, which in turn causes the private sector to contract its activity or at the very least keep it constant. As statist austerity causes GDP to stagnate, the welfare state’s budget problems are exacerbated. More people request assistance from its entitlement programs, while fewer people pay taxes. The budget problems that statist austerity was aimed at solving – again in order to make the welfare state look fiscally sustainable – actually cause a new round of budget problems. In response, austerity-minded governments tighten the fiscal belt yet another notch. All in order to make the welfare state more affordable to a shrinking economy. In other words, saving the welfare state is the prime directive of European fiscal policy. American fiscal policy has a different purpose. It aims to help the economy grow and lower unemployment. Granted, far from everything that comes out of U.S. fiscal policy is helpful in that respect, but at least the basic course of direction is right. Therefore, when representatives of the United States Treasury look at Europe and try to figure out what on Earth is going on over there, it is hardly surprising that some eyebrows go up and some foreheads are wrinkled. The United States warned Europe on Thursday (9 April) against relying too much on exports for growth, and urged officials to make more use of fiscal policy, saying stronger demand was essential. In its semiannual report on foreign-exchanges policies to Congress, the US Treasury Department gave a preview of the positions it will press on foreign policymakers during next week’s International Monetary Fund meetings in Washington. The world cannot rely on the United States to be the “only engine of demand,” the report insisted. It urged nations to use all tools available to accelerate growth and not rely only on their central banks to boost recovery. Before we get to the accolades, a technical comment. Exports is also “demand”, though from foreign buyers. The Treasury economists should know better and use the term “domestic demand”. Now for the accolades. It is refreshing and reassuring to see that the Obama administration’s Treasury understands how the economy works. This is not a sarcastic comment – this is a genuine word of appreciation. Europe, by contrast, is filled to the brim with economists and other fiscal-policy decision makers whose actions and decisions prove that they have basically no comprehension of macroeconomics whatsoever. An economy is driven by its demand side: household spending and business investments from the private side, and government spending. Since consumer spending is 65-75 percent of a well-functioning economy, the confidence and prosperity of the general population is quintessential to the survival, growth and prosperity of any nation. Furthermore, businesses invest because they ultimately will sell something to the general public. Therefore, confident households create confident businesses. A strong, forward-looking economy spends 15-20 percent of GDP on business investments. Without growth in these two private-sector spending categories, there will be no growth in the economy as a whole. The economists of the U.S. Treasury know this, and they operate based on this basic, common-sense macroeconomic knowledge. Their criticism of Europe’s governments for not understanding the same thing is highly valid and echoes, in fact, what I have been saying on this blog for three years. The report singled out Europe’s biggest economy, saying “stronger demand growth in Germany is absolutely essential, as it has been persistently weak.” The US Treasury argues that policy makers in the euro area need to use fiscal policies to complement the monetary stimulus that the European Central Bank is providing. … While growth in Europe has shown some recent signs of picking up, the region remains the sick man of the global economy. The problem for the Europeans is that they cannot do this. They cannot use fiscal policy to stimulate aggregate demand, because if they do they have to abandon statist austerity. Welfare states would again be allowed to go into deficits. There are many reasons why the Europeans cannot let that happen. The first and most immediate reason is called “Greece”. The EU is in a very tense showdown with the socialist Greek government over repayments of loans – loans that in turn were given as part of EU-enforced statist austerity. If the EU now abandoned its austerity policies, the Greeks would rightly ask “what about us? ?” and the 25-percent drop in GDP that followed the harsh implementation of statist austerity in the country. Another reason for the EU to stick to its austerity guns is the long-term concern for the welfare state’s fiscal sustainability. The Europeans are almost unanimously behind their welfare states and they are willing to sacrifice enormously for their ideologically driven big government. They have convinced themselves that the welfare state is not, has not been, and will not be the cause of their macroeconomic ailment. Therefore, they will try as best they can to defend the indefensible, namely the fiscal sustainability of the welfare state; that defense will take priority over any measures to help the private sector grow and thrive. For these reasons, and others, there is no hope for a growth-oriented fiscal policy in Europe. Speaking ahead of next week’s meetings, IMF managing director Christine Lagarde also warned that global recovery remained ‘moderate and uneven’ with too many parts of the world not doing enough to enact reforms even as risks to financial stability are rising. Mediocre economic growth could become the “new reality,” leaving millions stuck without jobs and increasing the risks to global financial stability, she insisted. Ms. Lagarde and others interested in the systemic roots of this growth crisis are more than welcome to read my book Industrial Poverty about the structural problems in the European economy. Again, it is encouraging to see American government officials notice and basically correctly analyze the differences between Europe and the United States. What is needed now is that those officials speak up about why the Europeans are ailing, and what the consequences will be for them and the world economy if they insist on protecting their welfare states at all cost. When a welfare state runs out of taxpayers’ money they run a so called structural budget deficit. That is a deficit that does not go away with strong growth but remains in the government budget, theoretically forever, in practice over a period of time longer than at least one business cycle. A structural deficit forces government to borrow continuously, i.e., to make borrowing a permanent revenue source on par with taxation. As I explained recently, of 14 member states in the European Union ten suffer from structural deficits when GDP growth is measured in current prices. When inflation is removed from the growth data, all 14 countries run significant structural deficits. Since this deficit analysis was limited by the availability of consistent data (only 14 states) it is not possible to firmly conclude anything about the EU as a whole. However, if 14 states, selected merely because of data availability, run structural deficits, then the likelihood is pretty high that the remaining 14 EU member states have similar problems with structural deficits. Structural deficits create a major problem for the countries whose governments have to borrow the money. The ongoing borrowing need depresses market demand for their bonds, eventually driving some countries with extreme deficits – think Greece of Spain – to have to pay massive interest premiums on their treasury bonds in order to attract buyers. To fix this, the European Central Bank came up with its own version of the American Quantitative Easing program: the central bank buys the bonds that the free market does not like. Quantitative Easing was a bad idea in the United States, as it allowed the federal government to continue spending money without reining in its increasingly uncontrollable welfare state. In Europe, the idea is even worse: the European welfare state is more “mature” than the American, making its structural deficit problems even more serious. Therefore, the QE program will feed a government that is even farther away from being able to pay for its ongoing expenses than the U.S. government is. The European Central Bank said Thursday it is increasingly confident that its controversial bond purchase programme is helping boost the eurozone’s economic recovery, even as a top official expressed doubts about its effectiveness. In the minutes of the governing council’s meeting on March 4 and 5 released on Thursday, the ECB said that “members generally shared the assessment that significant positive effects … could already be seen” from the new bond purchase programme known as quantitative easing (QE). First of all, the QE policy is not even a quarter of a year old yet. It would not be possible to identify causalities even if we tried with an economic microscope. Secondly, even if there are visible effects, they would be limited to lower interest rates. While it is true that the ECB has entered negative interest territory and decided to stay there for a while, it is important to remember that the negative interest rate became reality long before the QE program did. Furthermore, ultra-low interest rates do not fix Europe’s macroeconomic problems anymore than they have fixed Japan’s decades-long problems. [Some] prominent ECB members — notably the head of the German central bank or Bundesbank Jens Weidmann and ECB executive board member Sabine Lautenschlaeger — have repeatedly expressed doubts about the need and impact of such a programme. Lautenschlaeger told a German magazine on Thursday that she had “doubts whether the economic effects of the purchase programme will reach the desired magnitude.” And she warned that the current very low level of interest rates could lead to the formation of asset price bubbles. Before joining the ECB’s executive board, Lautenschlaeger was vice president of the German central bank and she shares the same scepticism as Weidmann. Nevertheless, at the governing council’s last policy meeting in Nicosia, Cyprus, in March, there appeared to be agreement that QE was indeed helping to ease financial market conditions and the cost of external finance for companies, the minutes showed. Coupled with recent positive economic data and signs of a turnaround in inflation, “this provided grounds for ‘prudent optimism’ regarding the scenario of a gradual recovery and a return of inflation rates to levels closer to 2.0 percent,” the minutes stated. This is actually disingenuous. Corporate borrowing costs have been declining since the Great Recession started. They started falling because banks still wanted to lend to non-financial corporations, but the non-financial corporations refused to take on more debt. They were simply far too pessimistic about the future of the European economy. In short: low corporate borrowing costs have absolutely nothing to do with QE. All in all, it sounds like the ECB is desperately trying to grab for positive news. this makes them prone to overlook the risks associated with QE, one of them being that governments simply decide not to do much more about their notorious deficits. This means, simply, letting the structural deficits remain as they are, whereupon the underlying problem in the European economy – an over-bloated welfare state – remains unsolved.